Description: It is a tall grass that makes up 2 m tall clumps. Leaves are long, with rough margins and are strongly aromatic.It is griown in gardens and also cultivated. 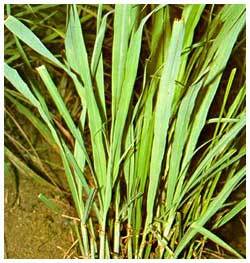 How to Grow: It is a very hardy grass and is very easy to maintain in the home herbal garden. It can be planted in the ground bed or in a pot of 25-30 cm size. Care regime: This grass being hardy does not require much care except that the dried leaves need to be periodically removed. Watering two to three times a week is adequate for its good growth. Collection: The grass is ready to start yield of its leaves almost immediately after planting. Mature leaves should be cut from near the base. The grass continues to provide leaves for many years.